Are you worried that you or your kids will spill something over your mattress, staining it for good? If so, you’re one of many. Investing in a great mattress is undoubtedly something to consider, but you’d also want to take the necessary steps towards protecting it. This will guarantee that you can use it for a longer period of time, without having to deal with unpleasant odors and ruined appeal. A top rated mattress protector (cover) is a solution that would solve all of the problems mentioned above while adding an extra level of comfort at the same time. That’s a product which is soft, thin and it feels a lot like a premium bed sheet. What Is A Bed Liner/Protector? However, with the market being as saturated as it is, getting the best one might truly be a challenge. There are quite a few things that you’d want to account for when it comes to it. This is why we’ve taken it upon ourselves to break it down and to provide you with the essentials of choosing a flawless liner. Additionally, we’ve also taken the liberty of reviewing a few options that we believe are the best on the market right. Hopefully, this would spare you quite a lot of time and effort and would prevent you from the aimless wandering around in different shops. SafeRest is undoubtedly one of the best options on the market, and it's brought to you by a reliable manufacturer with years of experience in the field. The product will conveniently protect your bed against perspiration, allergens, bacteria, dust mites, bedbugs, and fluids. It is backed by an extensive 10-year warranty, bringing additional reliability towards the product. The protector is made out of hypoallergenic cotton terry fabric which is 100% waterproof, breathable and noiseless. This guarantees that your sleep won't get disrupted while at the same time providing you with a perfect solution for people with allergies, asthma or eczema. Additionally, it's great for pet owners and people with children. The product is not going to alter the overall sensation of your mattress because of its design. It comes with a fitted sheet style design, and it is available for different bed sizes, even though this particular one is for a queen-sized bed. This particular product is made out of soft and breathable fabric which is specifically designated to deliver a cooler and far more comfortable sleeping surface. There is no plastic sensation or a crinkling sound to disrupt your sleep. This is a queen-sized protector and it fits a mattress with 60 x 80 inches dimensions. It is accompanied by a 10-year warranty. The product comes with a secure zipper to provide enhanced protection. 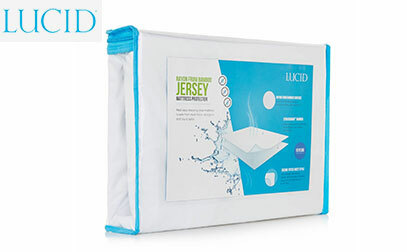 Additionally, it encases your entire bed with a smooth and lightweight fabric. This forms a reliable bed bug and dust mite repelling barrier while bringing comfortable sleeping sensation at the same time. The liner is machine washable and it could also be tumble dried conveniently. It's made out of vinyl-free materials and it is safe for both pets and kids. 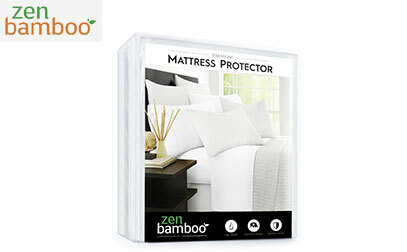 This is a mattress protector which is made out of 70% rayon from bamboo and 30% cotton. This combination brings an ultra-soft as well as moisture wicking sensation which guarantees a flawless sleeping sensation. The protector is noiseless which guarantees that it wouldn't disrupt your sleeping process and it is breathable yet protective and 100% waterproof. The technology behind the protective capabilities of the fabric is called STRATOSMART, and it represents a barrier which is designated to block liquids, allergens and dust mites. The entire thing fits snugly over the mattress, and it comes with deep pockets as well as stretches to fit even the thickest of products. It's machine washable, and it's quite safe for drying on a low heat setting. This particular option is fit for a queen-sized bed which measures 60 x 80 inches. It's backed by a comprehensive 15-year warranty, bringing additional reliability. The Zen Bamboo is made using an ultra-cool and breathable technology. This is intended to provide free flow of air and to prevent any unwanted heat retention. This is going to keep your bed cooled off throughout the night, hence attributing to a good night’s sleep. Additionally, it offers a fit that you’d genuinely love. It will cover beds of up to 72 x 84 inches and up to 15 inches in depth. OEKO-TEX certifies the liners and all of them are free of vinyl and PVC, hence being entirely safe for kids and pets. A lifetime warranty also backs the product. The protector is also hypoallergenic, and it provides the ultimate protection against bacteria, pet dander, and allergens. It’s perfect for people who suffer from asthma, eczema or any other condition made worse by common irritants. This is a queen size mattress liner which can fit a unit of up to 17 inches deep which measures 60 x 80 inches in size. It provides a fitted cover and it comes with elastic edges all around to guarantee the snugly fit. The material that it’s made out of is an ultra-tech polyester combined with viscose rayon. The latter is derived from natural bamboo blends which are designated to keep you properly cooled off throughout the night. It is machine washable and tumbles dry on low heat settings. However, you shouldn't be ironing the unit. Also, it's not advisable to use bleach or fabric softener. A mattress cover does exactly what the name suggests – it protects your mattress. There are quite a lot of different options on the market, but the vast majority of them provide additional protection against liquids and fluids. Some of them add additional security when it comes to allergens as they would prevent dust mites, bed bugs, and other potential dangers. Additionally, some liners come with special fabric as well as high-end materials which provide you with breathability as well as temperature control. This is capable of enhancing your overall sleeping process. Adding a bed liner will significantly enhance the overall longevity of your bed. It will also bring a myriad of different benefits. 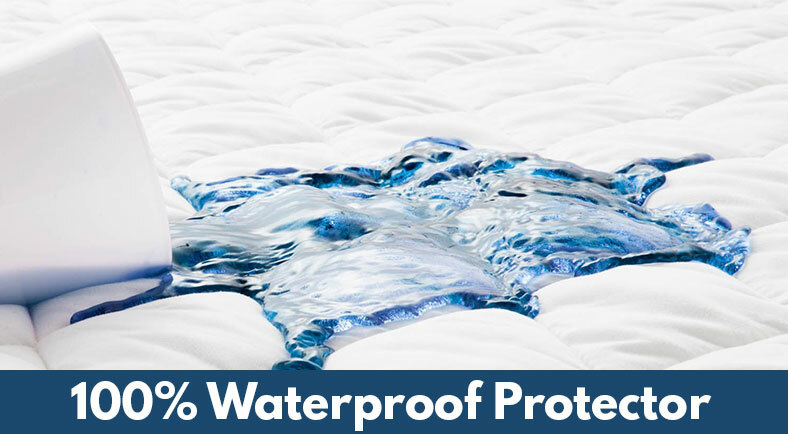 It would insulate the mattress and protect it from spillages, provided you opt for a waterproof protector. It will also act as a barrier against bacteria and bed bugs, hence reducing the chances of allergic inflammations and reactions. It is also one of the best solutions against bed bugs. This is a horrific menace, and one way to prevent it from entering your mattress is through encapsulating it with a specialized protector. The first thing that you ought to account for when picking your bed protector, regardless of whether it’s for a king-size or a regular-size bed, is the fabric that it’s made out of. It's usually tailored with a few different, softer and comfortable types of materials. Additionally, almost all of them have a waterproof layer. As we mentioned above, besides the materials as discussed above, most of the protectors will also feature some convenient and effective waterproof material. Most commonly, this is polyurethane. In certain situations, it could be replaced with vinyl. However, there are quite a lot of discussions led about protectors which contain vinyl with regard to their safety. This is why the majority of the companies prefer to make solutions which are vinyl-free. The truth is that the majority of the covers are made with one of the layers of waterproof fabric which is, as we mentioned above, polyurethane. In fact, the most significant difference between the mattress liner and the mattress encasement is the construction. Encasements are made out of the same material while protectors usually feature two layers with one of them constructed from waterproof fabric. This is something important, and it most definitely needs to be considered because it promotes a lot more comfort in comparison. If you want to make sure that everything is handled as per the highest industry standards, your bed protector must have a waterproof layer. Should it Protect against Bed Bugs? Now, liners usually only come with one additional layer of protection which is centered towards its waterproof capabilities. If you want to get something which would also prevent bed bugs from entering the mattress, it’s suggested that you get a full encasement. While it’s advised to consider this as an option, the bed cover in its nature would rarely feature full bed bug protection. In other words, if bed bugs are a concern where you live, it is highly advisable to prefer a full encasement instead of a regular mattress protector as it would do a better job. You should align your priorities accordingly to make sure that the solution fits your requirements and needs. How large should be your protector? This is something that a lot of people tend to wonder. It’s important to understand that there is a difference between a protector and a cover. While the latter is intended to lay conveniently on the mattress, the former needs to encompass it to the best of its abilities. The size of your protector would usually depend on the type of bed that you have. There are different sizes available, and you can buy one which envelops the entire mattress or one which covers it half the way to the sides. This depends on the level of protection that you desire. Typically, those that envelope the entire bed provide full-blown protection and are preferred by the majority of the clients. One of the most important considerations that you ought to account for when purchasing your bed protector cover is its breathability. Now, usually, there is a lot of misalignment about what manufacturers claim commercially and what the reality is, so reading reviews of actual customers helps a lot. The breathability of your liner will ensure that your mattress gets the necessary air flow. This prevents bacteria growth, and it prevents the accumulation of unpleasant smells, both of which are incredibly critical considerations. Furthermore, the more air gets through the liner, the lesser the chance of dust mite and bed bug infestation is. 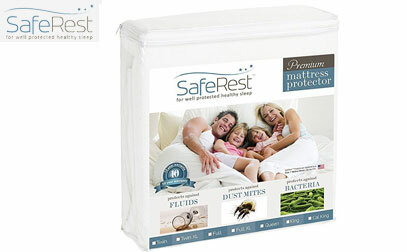 Only the top of the line mattress protectors have premium breathability as one of their main advantages. Now, keep in mind that any single type of moisture which hits the mattress is going to shorten its life by seriously wearing down the foam effectively. Without any protection, you're likely to have to replace your bed a lot more often, just to get that “like new” sensation. Additionally, spills and moisture might easily void the warranty. Most of the protectors these days include a waterproof layer. This keeps fluids such as sweat, urine and a range of other liquids from getting to the mattress. This is not only going to help you keep your warranty in place, but it’s also going to deliver a cleaner and a longer lasting bed, free of any spots and stains. Allergies have a serious impact on the way you sleep. 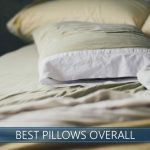 If you have the convenience of a protector that1 is made out of hypoallergenic materials, you are likely to find yourself sleeping a lot better. It’s also highly likely that you would stop suffering from those unpleasant itchy eyes and runny nose. Additionally, even if your sleep itself is not interrupted by your allergies, the discomfort that they bring tend to lead to improper sleep. This leads to you waking up tired and never being truly able to catch up. Bed bugs are amongst the most unpleasant pests that you might have to deal with. Once they manage to establish themselves in your bedroom, you’ll have a tough time getting rid of them, and you’re highly likely to have to get rid of it entirely. A full liner or encasement might be the perfect solution to your problems. There are some protectors which come with a zipper lock and bug flaps, which are designed to seal your entire mattress closely. This is a perfect solution for bed bugs, and it’s also a great way to protect your mattress from dust mites and other common allergens. One of the biggest challenges for your mattress is to remain stainless because of your kids. When children play around the bed, they tend to spill – there’s nothing extraordinary about it – it’s just how kids are. In addition to spilling, wetting the bed is a sure-fire way to ruin a great mattress. If you don’t have a protector, though, even the most common stain could become impossible to clean if you fail to handle it on time. And, as we most definitely know, kids would prefer to hide the trouble than to confront it, so you are unlikely to find out until it’s too late. With a convenient protector which has a waterproof layer, you wouldn't have to worry one bit. You just wrap it around and rest assured that it's thoroughly protected. It's as easy as this. Do Bed Liners Help Keep Your Bed Clean? Bed liners help keep the surface of your mattress clean but fail to do a good job everywhere else. 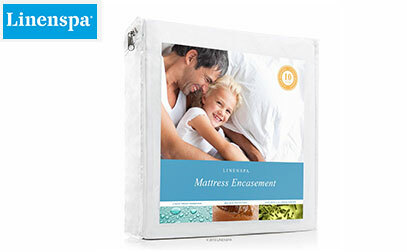 An encompassing breathable mattress liner, on the other hand, could easily provide you with a full enclosure. How Much Longer Can Your Bed Last With A Liner? Great bed covers are capable of prolonging the life of your mattress substantially. You are looking at a few years at the very least, given the fact that you’d have to wash it a lot less common, hence reducing a staggering amount of wear. Are Covers And Covers The Same Things? Covers and protectors are not the same things. A cover is a thick top layer which is usually made out of memory foam or latex, and it's used to adjust its comfort. A bed liner, on the other hand, is a regular, sheet-like solution which has the only intention of protecting the mattress. 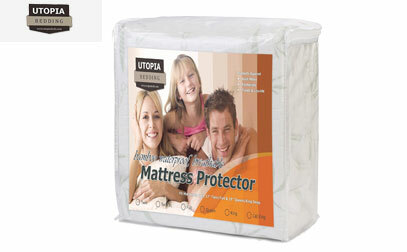 Having a mattress protector/liner is something which would conveniently enhance the overall lifespan of your bed. It’s also something which is capable of improving your whole sleeping sensation. The protector will also guarantee that your mattress will remain stainless, free of dust mites, allergens, pollen, bedbugs and other common problems that you’d otherwise have to deal with. We hope that the information above, alongside the quick yet informative reviews, would provide you with what you may need to make an appropriate choice for your particular solution. Picking a suitable liner doesn't have to be complicated.